'The Call' is a storytelling podcast that brings you tales from behind the badge. Join us as we immerse ourselves in stories told by the men and women who have answered the call to public service. Stories from behind the badge. Kaile and Tyler's story began in the United States Navy. The two worked together as welders on a ship that naval folks lovingly refer to as "The Love Boat". Friendship blossomed into romance, and after completing their service, Kaile and Tyler moved to Arizona to start their life together. Kaile was attending nursing school while Tyler pursued his dream to become an Arizona State Trooper. It was supposed to be the perfect love story. On July 25th, 2018, after just a few short months on the job, the unthinkable happened—Tyler was killed in the line of duty. To date, Tyler is the youngest fallen Arizona State Trooper. Join us as Kaile shares her heartbreaking story of Love, Lost In The Line Of Duty. 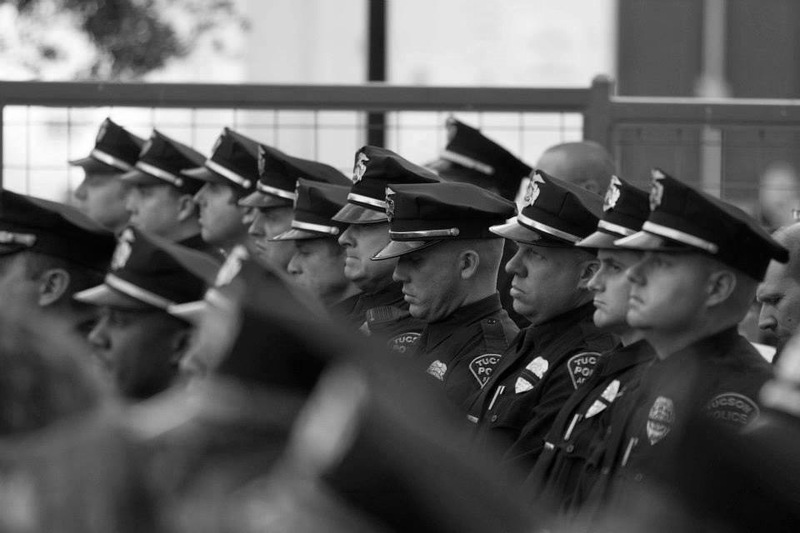 Each day, first responders are faced with the harsh realities of our world: darkness, death, danger, and pain. Some calls leave an indelible mark. Join us as Arizona Department of Public Safety’s Director, Colonel Frank Milstead, gives us a glimpse into his career in Law Enforcement and shares his most memorable calls. It's March of 1963. The time is approximately 11:30PM. Patricia Weir boards the bus following her shift at the Paramount Theater in Phoenix. She exits the bus at her stop at 7th Street and Marlette Avenue. As Patricia makes her way home, a man whom she does not know grabs her and forces her into his vehicle-- she is kidnapped, bound, and raped. Following the assault, Patricia's attacker drops her off near her home. At around 2AM, Phoenix Police Department receives a call from Patricia’s home at 1014 E. Citrus Way. Detective Carroll Cooley is assigned to the case. Little did Detective Cooley know, this call would leave a mark on American history and policing as a whole; the Miranda Rights would spring from Patricia's case. Steve, a retired Phoenix Firefighter, shares the story of a call that will stay with him forever. It’s circa 1990. 2AM. A three-story nightclub on Mill Avenue in Tempe catches fire. The building is old and has been renovated time and time again. Hidden spaces behind walls and beneath floors conceal fire and smoke. Electricity in the building remains on due to crews being unable to gain access to secure power to the building. These elements create a false sense of security- an illusion that the fire is not as advanced as it truly is. While Steve is conducting search and rescue on the second floor, the ceiling above collapses around him. Many first responders face the harsh realities of traumatic emotional and physical experiences throughout their career. In May of 2016, Officer Mark Valenzuela responded to a call that would forever change his life. Join us as we dive into Mark's tale of trauma, strength, and forgiveness. Our law enforcement officers and firefighters put themselves in danger every shift. A "typical" call can turn sideways in an instant. Detective Austin of Phoenix Police Department joins us to tell his story of a "run of the mill" Civil Standby that took an unexpectedly violent turn. Autumn's late husband, Tim Barber (a Detective with Tempe Police Department), passed away in 2011 after fighting a long battle with prostate cancer. Following Tim's death, Autumn was faced with the terrible reality of birthing and raising their unborn twins without her husband at her side. Autumn joins us to share her story of love, loss, and courage in the face of tragedy. In April of 2016, Peoria Fire Department Engineer Stephen Gunn and 70 other firefighters were dispatched to a house fire near 75th Avenue and Thunderbird. A home was engulfed in flames following an invasion that ended in arson and an elderly man was trapped inside. Gunn charged into the burning building through a window that had blown out from the heat of the fire. What happened next would earn the firefighter a nomination for the Presidential Medal of Valor and a trip to Maricopa County Burn Center. The video below shares this story from the perspective of the MCSO officer who first pulled Gunn aside at the fire. While on night patrol in 2014, Officer Sheffert and his partner came across a Young man sprinting down a busy roadway. The Teen’s behavior was strange for the neighborhood and the officers stopped him. The young man, Anthony Shultz, explained that he was out for a run because he was training for a wrestling match; Anthony was 16 years old. After talking for a few minutes, the three parted ways. Their paths would cross again when Sheffert responded to a domestic altercation call at a small apartment about a month later. The one-bedroom was home to Anthony and his seven family members. Following that call, Sheffert checked on Anthony frequently, talking with him for almost an hour each day. One day, Sheffert received a call from Anthony’s mother; she was kicking Anthony out of the house. The Sheffert family saved Anthony from homelessness and took him in as one of their own. Brandon Sheffert’s kindness changed Anthony’s life forever; Anthony became the first of his family to graduate high school in nearly 30 years and is entering the military this year. Our Podcast is officially live! We aren't on iTunes quite yet, but that should be coming within the next week. In the meantime, you can stream 'The Call' on Sound Cloud at soundcloud.com/thecallpod. Please also be sure to follow The Call's Facebook page at The Call! Episodes will be downloaded automatically to your device upon release.